2 tongue retainers, 1 with clear see through domes and a 14mm acrylic bar, and 1 with pink see through domes and a 14mm pink acrylic bar. 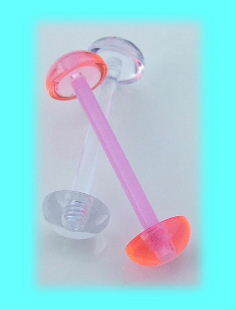 See through plastic tongue bar set, 1 with pink see though domes and an acrylic bar, and 1 with clear see though plastic domes and an acrylic bar. Both tongue bars are 14mm long, and the domes unscrew. These tongue retainers hide your tongue piercings even better than tongue reatiners with clear ball, as the domes lie fletter against your tongue, so there is even less to see. Ideal for making your tongue piercing invisible, so people can't see it. Powered by ShopFactory to sell P8682 online. All-in one eCommerce and online shopping cart software.